so stupid.. im sure the girl isnt intentionally letting the dog kill them. Forget “catching” the squirrel killer..lets catch the person or persons responsible for the horrid destruction of the park and misappropriation of funds…where is the money? why isnt the park done? where is the new dog run? why are the trees cut down? WHAT ABOUT THAT? Hi Pattycake, I’ve heard enough to believe that some malicious intent may be going on in relation to the woman and the squirrels. She knows her dog(s) is(are) aggressive – I don’t blame them, they’ve been encouraged by her – and I’ve heard other dogs have been attacked, to the point where she’s been banned from the LeRoy Park Dog Run. Re: the park itself, I agree with you! I’ve tried to get questions answered and more scrutiny on the process of the redesign of Washington Square Park at Community Board 2 meetings. The chair of the Parks Committee, Tobi Bergman, is very evasive and states there’s nothing more they can do. (He is a former NYC Parks Department employee, it should also be noted.) The chair of Community Board 2, Jo Hamilton, hasn’t given it her attention, leaving it in Parks Committee’s hands, but I don’t think people are pressuring her about it either. I’ve written to City Council Member Margaret Chin – who took Alan Gerson’s place – with finally a response from her sister who works in her office. I sent a bunch of follow-up documents and then received no further communication. Without a loud yet effective group asking questions, I don’t know how anything can be achieved. People who were involved for years need to become visible and outspoken again; too many have become silent. And new voices are needed as well. I am happy to have others speak out ! PLEASE CONTACT City Council Member Margaret Chin at chin@council.nyc.gov. It’s her district. She took Alan Gerson’s place but has not been involved at all. She needs to hear from people that they want her involved. You ask good questions but asking them of (CB2 Parks Chair) Tobi Bergman and (CB2 Board Chair and WSP Task Force Chair) Jo Hamilton and Margaret Chin would be a great follow-up. p.s. Which trees are you referring to? Did you notice with NYC Mayor Mike Bloomberg that libraries, senior centers, animal protection, firehouses, police department and more are cut from the City Budget but never elaborate and unnecessary redesigns of parks? Oh, and I never wrote a report back on the last Community Board 2 Parks Committee meeting held October 6th addressing Washington Square — after 10 long months of silence — because it was mostly an exercise in frustration. (Although any doubts about Tobi Bergman’s role in stopping closer scrutiny of the redesign of the park were put to rest.) The Parks Committee has not met for the past two months following the meeting. After the initial euphoria of just having the park opened and reveling in the perfect spring day, I reflected on where the $13 million went, and now realize what disturbs me. I miss the sunken fountain, so beautifully set apart from the street. Now the fountain is an extension of the street, instead of the beginning of something completely different. You felt drawn down — invited into the fountain. Now it’s more like the fountain is an object you are supposed to look at instead of being drawn into, to experience. The redesigned park looks like something imposed on the Village, boring and uneventful: flattened out. The fountain area, bland and generic, instead of exciting and unique, looks more like a corporate plaza than a park. The huge walkway with the gigantic planters in the middle looks like an outdoor mall in Wisconsin. And that poor tree around the fountain, died of a heartache. Now linear — before idiosyncratic; there was an off-centeredness that was deliberate. It represented people who live in the Village who march to a different drummer. Our park embodied democracy, now transformed undemocratically. The landscaping is prissy, organized patches of vegetation not unlike that found in the gardening section of any Home Depot. But it all goes so well with N.Y.U.’s Kimmel Center. The park now looks like another N.Y.U. project, with the two telltale plaques on either side of the “Tisch! Fountain.” I can’t bring myself to say that. Too bad the fountain hadn’t been auctioned off to the highest bidder. It seems a $2.5 million advertisement for perpetuity is just dirt cheap. The walls that surrounded the theater in the round created an acoustical field for the music; sound bounced back out, radiating from behind. Now there is nothing to deflect the music, it all gets meshed together with the competing sound of gushing water. With the stroke of an architect’s pen, the park was forever stripped of its bohemian character, wiping away decades of history. We hope this sacrifice of comfort and possible clamoring for a conservancy (the privatization of our public park) will not kill the spontaneous creativity that happened naturally here, once upon a time. We hope that glorious time will not die like the tree in the circle. As someone whose dog insists we Washington Square on a daily basis now that the weather’s good, I find that nothing seems to look “right” when we enter from the South. In the older design, with the fountain to the west and more open space coming up from Thompson Street, there was a more gradual lead-in to the circle. Now the path certainly looks skewed and, in photos, it’s nearly impossible to form a visual grid of major planes. Sometimes designs that appear so perfect on paper don’t necessarily work out in three dimensional visual space. Or maybe Stanford White and others involved in the park’s major features knew a thing or two about dealing with asymetrical space. So… what is the “every day” use of this space? Will there be more professional performances – and which should the Park be oriented to? … Although I’m sure no matter how you slice it, this area’s design should be reconsidered. 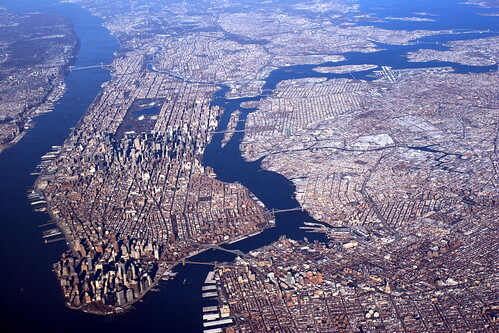 The New ‘Old’ vs. ‘New’ New York? If you follow the Vanishing New York blog, Jeremiah catalogs all the doom and gloom stories in the media of what a recession/depression might mean for NYC (The end of NY as we have more recently known it… ? Yes. Please). He writes about why some people (his readers, for one, who have been watching our city … vanish) actually feel this turn of events might bring something back to New York City. The more recent incarnation of NYC is too sterile, overly homogenized, massively commercialized. We need a bit more grit, creativity, diversity, art, community, some real bohemia (not a Marc Jacobs’ version) and less emphasis on GREED. Perhaps eventually even Mayor Bloomberg will catch on. With that in mind, I share this story from this week’s New York magazine. Note: Reading some of the archives of the original Gowanus Lounge site, Robert Guskind’s blog, and his eclectic mix of entries, has inspired me to diversify my site a bit more. If you’d like to read some of them go to: Gowanuslounge.blogspot.com. Curbed Highlights of ’08, featuring the Mounds, Waterfalls, NYU destruction of Provincetown Playhouse and more! Some days Curbed just makes all the difference. Check out the “Curbed Awards’ 08: The Neighborhoods in Glorious Detail!” I, for one, miss being entertained reading about the “public art” of the Waterfalls and their (or despite their) arborcidal ways. Curbed is a bit concerned about the Mounds’ longevity at Washington Square Park in the next phase (II) of the Parks Department’s redesign plan … and tells us what’s going on with Provincetown Playhouse now that NYU has its way. What’s Up with the Mounds? Why People Like Them. I admit to at first being a little confused by the Mounds, the “three hills” located in the southwestern part of Washington Square Park. After doing some research on them, I can see their value. The Mounds were created during the 1970’s design of the Park and were part of an “adventure playground” for older children. Ten years after they were installed, the Parks Department paved them over with asphalt, a substance, according to Mounds advocates, they were not meant to be covered in, and it led to a decline in their appearance as it broke down. The linked footage is from the documentary, “Square: Straightening Out Washington Square Park“. The first person speaking is the Parks Department’s (controversial) landscape designer George Vellonakis. Later in the piece, sitting at a table with advocates for the Mounds, you’ll encounter City Council Member Alan Gerson informing people – at a point when it did not look like the Mounds would be saved – that temporary sledding structures would be brought to the Park in the winter to counteract the loss of the Mounds for that usage. Thus far, the Mounds have been saved and are scheduled to be recreated. The most controversial part in that plan at this point is the use of artificial turf around the Mounds (see previous entries on the plans and on artificial turf). Watch video “The Three Hills” here. “Places of spontaneous play…” Isn’t that part of Washington Square Park‘s charm overall and what makes it so unique … part of its renown? It offers places of spontaneous play — in the form of music, art, protest, conversation. Yet the New York City Parks Department insists on attempting to pacify this public space by … reducing the areas in which these activities occur, adding more and more LAWN and little plazas (has anyone been to a suburban town square lately? ), removing the unique and widely used seating alcoves, reducing the area around the chess tables, heightening the fence, and more. Jonathan Greenberg is the founder of the Open Washington Square Park Coalition and lived near Washington Square Park for more than 30 years. He has fought tirelessly to preserve the public space and unique aspects of Washington Square Park despite the obstacles and obfuscations put in play by the Bloomberg Administration and New York City Parks Department. He shared this letter with me and it is today’s guest entry. Your recent front page City section coverage of the “Battle of Washington Square” (November 23, 2008) set reality on its head by distorting and misreporting the truth about why Greenwich Village community activists like me are angry about the radical redesign of Washington Square Park. Despite the article’s 2,300 word length and the fact that he has confirmed knowledge of every fact in this letter, Times reporter Graham Bowley decided to ignore the most relevant information that the “Paper of Record” ought to have provided readers with. In portraying community activists like myself as “bitterly angry” and full of “fury,” as we tried to “write our desires” on a park that we treat as our “personal fiefs,” while reporting, unchallenged, Parks Department claims that the “transformation of Washington Square Park has been one of the most open in the agency’s history,” the Times leaves readers with the insulting impression that the lawsuits and protests over the park’s redesign were much ado about nothing, except the egos of those involved. For instance, the Times reports that in October, 2005, Community Board (CB) 2 “rejected” a compromise that would have limited the reduction in the park plaza’s size. Incredibly, the article fails to note that neither the Board, nor the public, were ever provided with the plans for the park redesign, nor were they told the truth about the reduction in the size of the park’s plaza. This was documented both in a judge’s ruling in favor of our first lawsuit, as well as in a web video which my group created and posted. In May, 2007, the same Community Board voted, 40 to 5, to rescind its earlier approval of the plan, because it had been provided with inadequate and incorrect information. Remodeled Look of Washington Square Park = Mary Poppins’ London Circa 1964? A reader named Miriam wrote in yesterday about the remodeled look of Washington Square Park (NorthWest Quadrant) completed thus far. Has anyone commented on the fencing that has already been installed? It looks cheap, gimmicky, poorly scaled, and incredibly flimsy–the uprights are thinner than my 77-year-old arms. None of the new fencing will last more than few years. Just as I suspect will be true of the whole new park, the fencing is a triumph of someone’s fantasies of a London park as inspired by the 1964 movie, Mary Poppins. Do these designers have any practical experience? As for maintenance–good luck with it in the coming times. I fear we are going to be stuck with a half-finished, poorly maintained Washington Square. Actually, I know we will be. Sad. 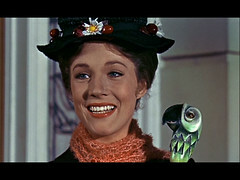 I think Miriam may be onto something with the Mary Poppins look going on. The lamps would fit into that theme also. Great movie but … ?? Two important routes to go – Contact Christine Quinn who is the Speaker (head) of the NY City Council and also your local City Council person who, presumably, will have to vote on this matter of extending term limits without voter ratification. (1) Speaker Christine Quinn – The Mayor knows (beyond a doubt) that he can count on her support. However, she needs to hear from you to know that overturning voted-in term limits is not okay. With Washington Square Park, Christine Quinn did not come through for the majority of her constituents who wanted the park renovated while retaining the Park’s character. Instead, once again, she caved in to Mayor Bloomberg’s wish to radically overhaul and pacify this renowned public space. However, the term limits issue is a MAJOR issue that she can not take a major hit from, whether Mayor Bloomberg, her billionaire friend, wants it or not. She is putting herself on the line here for him by working to overturn the voter’s wishes. Christine Quinn must recognize that there ARE limits and it’s time for her to show some principle. (2) Contact Your Local City Council Person on the term limit issue here. There are 51 community districts in New York City and each has a City Council person who is elected. Your City Council person needs to hear from you. If you are not up to speed on the issue, scroll down and read some of the posts below.